Shane Shirley : Green Giveaway...Win a KC Malhan Peace Bag from Environmental Booty and OpenSky! Green Giveaway...Win a KC Malhan Peace Bag from Environmental Booty and OpenSky! I am so excited to offer you this exclusive deal on one of my favorite KC Malhan Eco bags... you can enter to win one for FREE! I love this bag because it is one of the hottest Eco-bags I have found and a great way to wear and share your message for peace! Perfect with jeans for day or that little black dress for a night out. 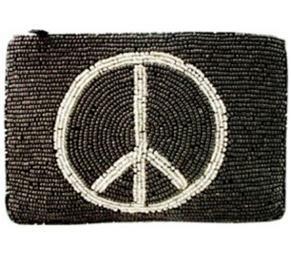 Handmade with lead free beads, this KC Malhan Peace Bag is the total eco package. No worries if you aren't the winner of this Eco-bag valued at almost $40. Every single person who enters will win a 10% discount coupon good for any purchase in my Environmental Booty OpenSky Shop. I am really proud to offer one of a kind products that you can't get in your local big box shop or on Amazon. The coupon is good for just one week from today so don't wait to pick out your favorite green living products in my shop! What are you waiting for? Enter the Peace Bag giveaway before the chance is gone today at midnight and then get ready to win with Environmental Booty and OpenSky.